This is a nutritionally complete, starting ration for growing show turkeys from hatch to eight weeks of age. This 30% protein diet is designed to develop poults to their full genetic potential. 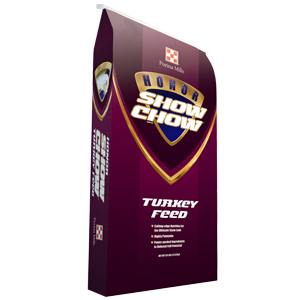 Honor Show Chow Turkey Starter can be followed by Honor Show Chow Turkey Grower/Finisher from eight weeks of age through show. Honor Show Chow Turkey Starter is supported by Purina Mills knowledge, experience and research. Feed continuously as sole ration to turkeys from hatch until 8 weeks of age. Toms will consume between 12-14 lbs. of feed and hens will consume between 10-12 lbs. of feed to 8 weeks. Important: A feeding program is only as effective as the management practices and disease control measures followed. Caution: Store in a dry area away from insects. Do not feed moldy or insect-infested feed to birds as it may cause illness, performance loss or death. The Winning Matrix™ Efficient production requires a thorough understanding and application of the fundamental principles of good husbandry and sanitation. These include: 1. GOOD BREEDING: Good breeding gives poultry the ability to perform satisfactorily and produce healthy offspring. 2. GOOD NUTRITION: An adequate amount of a balanced ration containing all required nutrients, vitamins and minerals is essential for good health and proper conformation. 3. SOUND MANAGEMENT: “Know How” is required to provide the proper environment and care to minimize stress, which can adversely affect development. 4. CAREFUL SANITATION: Cleanliness is essential in providing a healthful environment. These are the building blocks of the Honor® Show Chow® Poultry feed program and the keys to successful poultry production. Practical application of these basic principles will not only enhance your birds’ growth and development, but also increase their potential of winning on the show circuit.